At The Safety Centre we cannot stress enough the importance of proper Fire Extinguisher Maintenance, fire extinguishers require frequent and through servicing to ensure that in the event of an emergency they discharge safely and correctly. Maintenance should take place every 12 months after the initial installation and should always be carried out by a suitably trained engineer. Employers have a legal responsibility to under-go regular maintenance of fire extinguishers under the Fire Safety Order or (FSO). Further to this, monthly visual checks to check for signs of damage, corrosion or other signs of wear and tear that may affect the safety of a fire extinguisher by a responsible member of the organization. If your company employs 5 or more people then written records of service, maintenance and inspections must be held in a fire extinguisher log book, which can be purchased from The Safety Centre. Fire extinguisher covers and stands are also available from The Safety Centre and are a low cost method of ensuring your fire extinguishers safely stored and protected. In the event of an emergency and the fire extinguisher is discharged, however small the discharge, the fire extinguisher then needs to be fully serviced and recharged to the manufacturer’s specifications. All of which your fire extinguisher maintenance provider should be able to undertake for you. 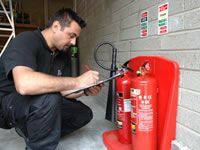 Here at The Safety Centre we can provide Fire Extinguisher Maintenance (within 30 miles of Clitheroe, Lancashire). Contact us on 01200 428 410, email us on sales@thesafetycentre.co.uk or use the Livechat facility below to discuss your fire extinguisher maintenance needs. If you’re interested in these services you may also be interested in our Fire Extinguisher Maintenance Label and Fire Alarm System Log Book ranges.